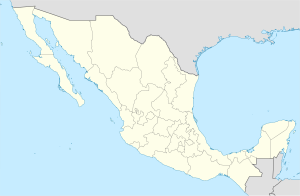 Bejucal de Ocampo is a town and one of the 122 Municipalities of Chiapas, in southern Mexico. It covers an area of 82 km². It was named in honor of Mexican lawyer Melchor Ocampo. As of 2010, the municipality had a total population of 7,623, up from 6,673 as of 2005. The municipality had 37 localities, none of which had a population over 1,000. It is the least-Catholic municipality in Mexico’s least-Catholic state, with only 19% of residents being Catholic, and most being Jehovah’s Witnesses or Baptists. ^ "Bejucal de Ocampo". Chiapas State Government. Retrieved April 19, 2013. ^ a b "Bejucal de Ocampo". Catálogo de Localidades. Secretaría de Desarrollo Social (SEDESOL). Retrieved 23 April 2014. ^ "Bejucal de Ocampo". Enciclopedia de los Municipios de México. Instituto Nacional para el Federalismo y el Desarrollo Municipal Gobierno del Estado de Chiapas. Archived from the original on September 30, 2007. Retrieved July 25, 2008. ^ “Religion in Mexico: Where angels fear to tread: Evangelicals are swooping on long-ignored regions”, The Economist, dated 24 March 2012. This article about a location in the Mexican state of Chiapas is a stub. You can help Wikipedia by expanding it. This page was last edited on 17 July 2017, at 07:10 (UTC).